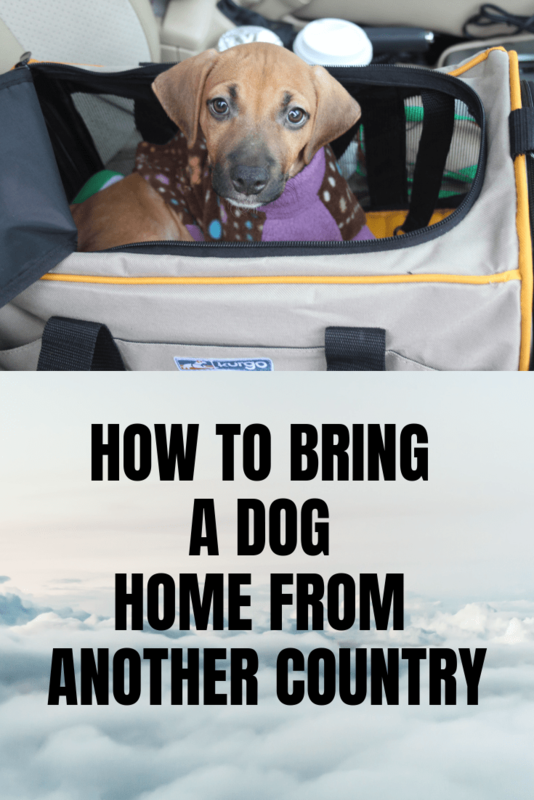 Working for an international animal rescue organization, one of the things I get called about the most is from people who have found a dog while traveling and want to know how to bring it home with them. There are no exact guidelines because each airline and each country will have their own rules and regulations, but it can be done and generally it is not as hard as you think. The first thing you should do is contact your airline, as they will be able to tell you what the requirements are. Health certificate- a simple exam by a veterinarian that says that the animal is healthy enough to travel. It usually cost about $20 USD. The health certificate usually has to be done within 7-10 days of traveling. Vaccinations- usually the only legally required vaccination is rabies. The USA has a requirement that the dog has to have a rabies vaccination at least 30 days prior to travel. Puppies cannot be vaccinated until they are 3 months old, so the youngest a puppy can be to travel is four months. If you are traveling from a rabies-free country, the dog will be exempt. Check the list here: http://www.cdc.gov/importation/rabies-free-countries.html. I would also recommend getting a distemper vaccination, as well as treating the dog for fleas and parasites (de-wormer). Appropriate carrier- this is dependent on the dog’s size and where it will be placed on the plane. If a dog is under 20 pounds, many airlines will allow the dog to count as your carry on. A soft-sided carrier is typically the best since the dog has to be able to fit under the seat in front of you for take-off and landing (generally 17″L x 12.5″W x 8.5″H, but they usually allow larger carriers than the stated size as long as they fit under the seat). Some airlines, such as Jet Blue, will even sell you an inexpensive carrier to use. If the dog travels as cargo, a hard plastic vari kennel will have to be used. The dog has to be able to stand up and turn around in the kennel. Food and water have to be available. Identification- this is an important safety precaution. Have your pet microchipped if possible and have the dog’s name as well as your contact information on his collar at all times. Don’t forget a leash. Most airports will have a designated pet area for dogs to go to the bathroom outside- although if you have a young puppy who hasn’t had all three distemper vaccinations, I would not suggest bringing it there. You don’t want to expose the puppy to disease especially when their immune system is not fully developed. Rescues suggest going into a family size bathroom stall and putting newspaper on the floor for the pup. This is the cheapest, safest and easiest option. The animal stays with you so you can monitor it at all times. Withhold food about 4 hours prior to the flight so that the dog has less of a chance of getting sick or having an accident in the carrier. Just in case, bring a pile of paper towels and a plastic bag. You should also have a small water bowl and a baggie of food in the case of a long layover. I am always amazed by how well dogs travel. They usually just sleep quietly and nobody even knows they are there. An airline typically charges a $100 pet fee and the dog counts as your carry on. Have documentation in hand at all times. Make sure you call the airline to book the animal on your flight. If a dog is not eligible to travel in the aircraft cabin, it will have to go in the cargo area. Airlines usually charge $100-200 for this also but you have to purchase a vari kennel, which can be difficult to find in some countries. If you can’t find one, ask the airline, a local shelter, or vet clinic if they have any you can buy from them. The most important thing to consider here is the weather. It may be fine where you are, but if it is below freezing or very hot where you are landing, they will embargo the flight if they do not have a temperature controlled cargo area. Get to the airport early to check the dog in because many times you will be dropping the dog off in the cargo area which is not where you will be checking in. Make sure you call ahead to book the dog on the flight and make sure that it is safe to fly. Be sure to write your name on the kennel and attach copies of the dog’s paperwork to the kennel. Be sure the dog has access to food and water at all times. Clip on dishes work well. Some airlines will ask you to tape a baggie of food to the carrier. As you board the plane, always inform the pilot that there is a dog in the cargo area. Most of the time, they have no idea what they are transporting. Be vigilant of how long you sit on the tarmac or where the dog is if you have a flight delay. Keep in mind that there is no heat or air-conditioning in cargo areas of the airport or the plane and deaths have occurred. Also be vigilant during plane transfers and make sure that the dog made it to your connecting flight. Un-attended flight- the dog is traveling without you. Good luck and thank you for saving a life!